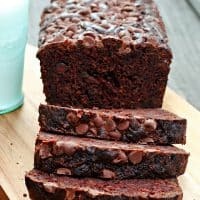 DOUBLE CHOCOLATE ZUCCHINI BREAD — This decadent chocolate bread is studded with chocolate chips and loaded with fresh zucchini. 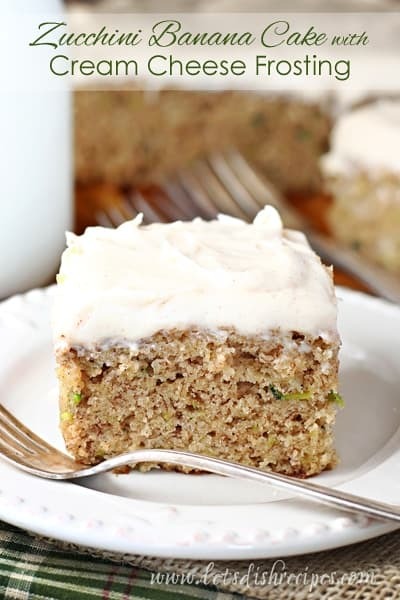 The best zucchini bread you’ll ever make! I don’t know about you, but the only way I can feed my family zucchini is hidden in baked goods. And this Double Chocolate Zucchini Bread is my absolute favorite way to deliver zucchini incognito. My husband loathes zucchini, even in baked goods. And he couldn’t get enough of this decadent, chocolate chip studded bread. Between him and my hungry teenagers, I barely got a piece for myself! The bread is so moist and full of chocolate flavor, it’s hard to imagine enjoying a chocolate loaf without zucchini. Yes, there are four cups of zucchini in this recipe. It may seem like a lot, but trust me, it’s just perfect. You can put all of the chocolate chips into the batter, but I like to keep some for sprinkling on top. This also makes great muffins and mini loaves, just be sure to adjust your baking time accordingly. *Note: the original recipe stated that this recipe would make two 9×5 inch loaves. I usually just get one 9×5 loaf plus one mini loaf. If you’d like two loaves, I suggest using slightly smaller loaf pans. 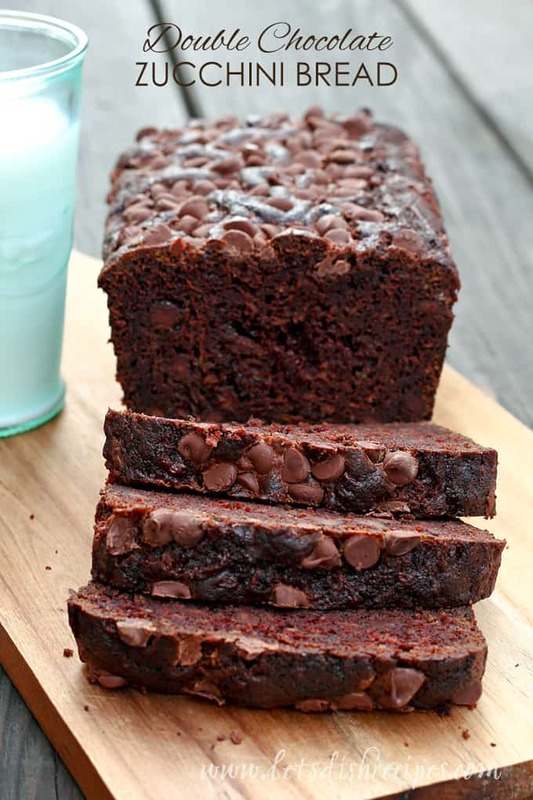 This decadent chocolate bread is studded with chocolate chips and loaded with fresh zucchini. The best zucchini bread you'll ever make! Preheat oven to 350 degrees. Grease two 8×4 inch loaf pans, or one 9×5 pan. 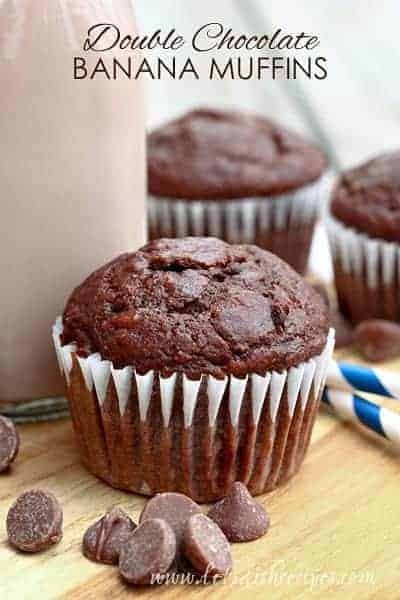 In a large bowl, combine flour, cocoa powder, baking soda and salt. Add the flour mixture to the sugar/butter mixture and stir to combine. Do not over mix. Fold in grated zucchini and 1 cup of chocolate chips. Bake for 40-60 minutes (depending on size) or until an inserted knife comes out clean. If necessary, cover with foil during the last 10-15 minutes of baking to prevent over-browning. Who Dished It Up First: Adapted from Your Cup of Cake. Chocolate and zucchini, what a very unique combination! That bread looks absolutely delicious. 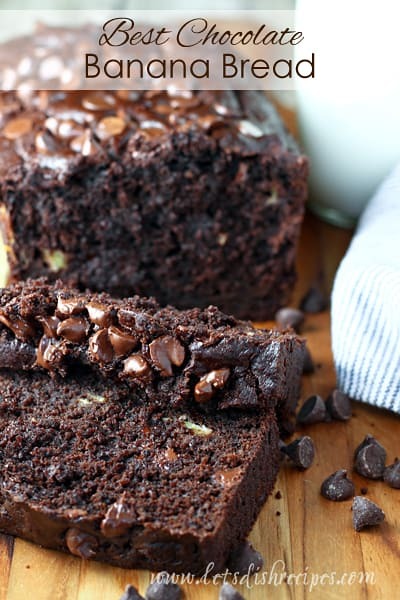 I love zucchini bread, but the chocolate makes it sound really delicious! This recipe couldn’t come to me at a better time. I have some zucchini to use and I am running out of ideas. (I only planted one this year, but it’s very prolific.) My family will love this chocolate zucchini bread as a change from the usual one. Thank you so much for sharing. I just made this bread….li followed the recipe exactly, The batter filled a pampered chef 4-mini loaf pan stoneware pan. I just have to say….I think I’m going to eat all four mini loaves right now as I burn myself eating them because they are sooooo good!!! I made this over the weekend and let me just say.. definitely a keeper recipe! It was so delicious and chocolately, I will absolutely be making this again! I had to keep it in the oven for a bit longer than 60 minutes, though, closer to an hour and half. Since I only had a 9 x 5 inch loaf pan, the batter had to go into one pan and it was just so big that the center was still uncooked after 60 mins. Delicious! I made these as written, except I baked them in muffin pans for better portability. The 9-year old was eyeing the batter with suspicion. It took some coaxing to get her to try a bite, but she said they are yummy. Whatever it takes to get her used to veggies other than broccoli, peas and carrots!